AUSTINTOWN – Hayden Kristophel’s walk-off double in the bottom of seventh inning lifted the Eastern Gateway Gators to a 5-4 victory over Lakeland Community College on Saturday and a doubleheader split at Austintown Fitch High School. Kristophel’s hit scored Jeremiah Papa with the game-winning run as EGCC (14-12, 8-8: OCCAC) salvaged a split of their four-game weekend series with LCC. Papa had three hits, including a double in the second game with Doug Painter also adding a double to pace the Gators offensively. Derickmael Cuadrado picked up the win in relief of Logan Torma. In the opening tilt, Lakeland defeated the Gators 12-10 despite 11 hits by EGCC. Painter and Evan Knaus each had three hits, including a double and Antonio Walker two for the Gators. Cuadrado suffered the loss as he earned the decision in both games. Eastern Gateway will next play at CCAC-Boyce on Wednesday with first-pitch slated for 1 p.m.
AUSTINTOWN – The Eastern Gateway Gators split a doubleheader with Lakeland Community College Friday, winning the first game 8-2 while dropping a 12-7 decision in the nightcap at Austintown Fitch High School. Noah Laster, the reining Ohio Community College Athletic Conference “Pitcher of the Week,” went the distance in the opener to pick up the win, striking out nine, walking just one and scattering 10 hits. Doug Painter and Hayden Kristophel each had three hits with Painter adding a double to pace EGCC (13-11, 7-7: OCCAC) offensively. The Gators’ 13-hit attack also included two hits with a double from both Grant Williams and Jeremiah Papa. In the nightcap, Laster and Evan Knaus each homered and had three hits with Knaus and Painter also adding doubles. Josie Ayala went four innings, allowing three runs on six hits as Logan Torma absorbed the loss in relief. The two teams will conclude their four-game series Saturday with another twin bill beginning at 12 noon at Rich Coppola Field. AUSTINTOWN – Grant Williams and Noah Laster narrowly missed hitting for the cycle as Eastern Gateway defeated Lorain Community College, 13-3 Wednesday at Austintown Fitch High School. Williams reached base all four at-bats with a three-run homer, single, walk and double while Laster added a solo home run, single, walk and triple to pace the Gators (12-10) offensively. Doug Painter also had a homer and a double, Evan Knaus two doubles as EGCC pounded out 14 hits for their third time in their last five outings. Alfredo Cruz picked up the win while Lorain fell to 9-12. The Gators will host Lakeland Community College in a doubleheader Friday beginning at 12 noon at Rich Coppola Field. YOUNGSTOWN – Eastern Gateway Gators pitcher Noah Laster has been named the Ohio Community College Athletic Conference “Pitcher of the Week” for games played April 1-7, it was announced today by the league office (http://www.occac.org/POTW_4-8-19). Laster, a freshman who starred scholastically for the Jackson-Milton Blue Jays, earned his second weekly honor this season after posting a 2-0 mark for the week as the Gators moved to 11-10 overall and 6-6 in league play. EGCC hosts Lorain Community College Wednesday in a single, nine-inning game beginning at 2 p.m.
All Gators home games are played at Austintown Fitch High School’s Rich Coppola Field. NILES – On Friday, April 26th, the Eastern Gateway Gators’ baseball team will be hosting their annual “9th Inning Dinner” at Ciminero’s Restaurant (123 North Main Street) in Niles. Proceeds will benefit EGCC athletics with a silent auction, 50-50 raffle and raffle baskets available for bid to those in attendance. Cost is $40 each with doors opening at 6 p.m. and dinner served at 7 p.m.
Further information can be obtained by calling Abbie Twyford Wilson at 330-480-0726, ext. 3129 or via e-mail at [email protected]. PERRYSBURG – The Eastern Gateway Gators split their second consecutive twin bill Sunday with Owens Community College, losing the opener 17-7 then posting a 4-3 win over the Express in eight innings in the nightcap. In the opener, freshman Noah Laster continued his assault on conference pitching going “4-for-4” to pace the Gators offensively. Evan Knaus had two doubles while Andrew Wess and Doug Painter each added two hits. In the nightcap, EGCC (11-10, 6-6: Ohio Community College Athletic Conference) pitcher Josie Ayala threw all eight innings for the complete game win. Grant Williams and Wess each had two hits, including a double. Painter also had two hits, posting the game winning RBI in the eighth inning. The Gators will host Lorain Community College Wednesday at Austintown Fitch High School’s Rich Coppola Field. First pitch is set for 2:00pm EST. PERRYSBURG – The Eastern Gateway Gators split a doubleheader with Owens Community College on Saturday, winning the opener 7-4 while dropping the nightcap, 11-0. Freshman Noah Laster picked up the win in the first game while Doug Painter’s two hits paced EGCC (10-9, 5-5: Ohio Community College Athletic Conference) offensively. Nick Benson had the lone hit and was the only offense for the Gators in the nightcap. Dylan Dickey absorbed the loss. The two teams will conclude their four-game series with a twin bill today at the Owens Express Outdoor Sports Complex beginning at 1 p.m.
YOUNGSTOWN – Please be advised that this weekend’s OCCAC four-game series at Owens Community College, originally scheduled for doubleheaders on Friday and Saturday, will now take place on Saturday and Sunday. First pitch both days is slated for 11 a.m. In other scheduling adjustments, the Gators’ April 23 game at Delta Community College has been cancelled while EGCC’s May 1 contest at Lorain Community College is now a doubleheader. AUSTINTOWN – The Eastern Gateway Gators split a doubleheader with Edison State for the second consecutive day on Monday, winning the opener 9-5 while dropping the nightcap, 2-1. Hayden Kristophel reached base five times in the opener, going “3 for 3” with two walks, driving in three runs to pace the Gators (9-8, 4-4: OCCAC) offensively. Noah Laster added two hits, including a double while Andrew Wess also drove in three runs. Derick Cuadrado went seven innings, scattering four hits and allowing just two runs while striking out three for the win. In the nightcap, Jake Clements had three hits including a triple, walk and stolen base to pace the Chargers (9-11, 5-5). Layne Riley went the distance to pick up the win, allowing just one run on seven hits while striking out nine. Doug Painter had two hits and Evan Knaus a run-scoring single to pace EGCC. Josie Ayala went six innings and allowed both runs, scattering seven hits in a losing effort. The Gators will play doubleheaders Friday and Saturday at Owens Community College. AUSTINTOWN – The Eastern Gateway Gators split a league doubleheader with Edison State Monday, winning the opener 3-1 then dropping the nightcap, 11-6. In the first game, Noah Laster fired a complete game, two-hitter, striking out 10 without allowing a walk to pace EGCC (8-7, 3-3; Ohio Community College Athletic Conference). He also hit a solo home run and added a double offensively. In the nightcap, the Chargers improved to 8-10 with the win as Evan Knaus paced the Gators with three hits, including a two-run homer and two doubles. Hayden Kristophel also had a double as Dylan Dickey absorbing the loss. 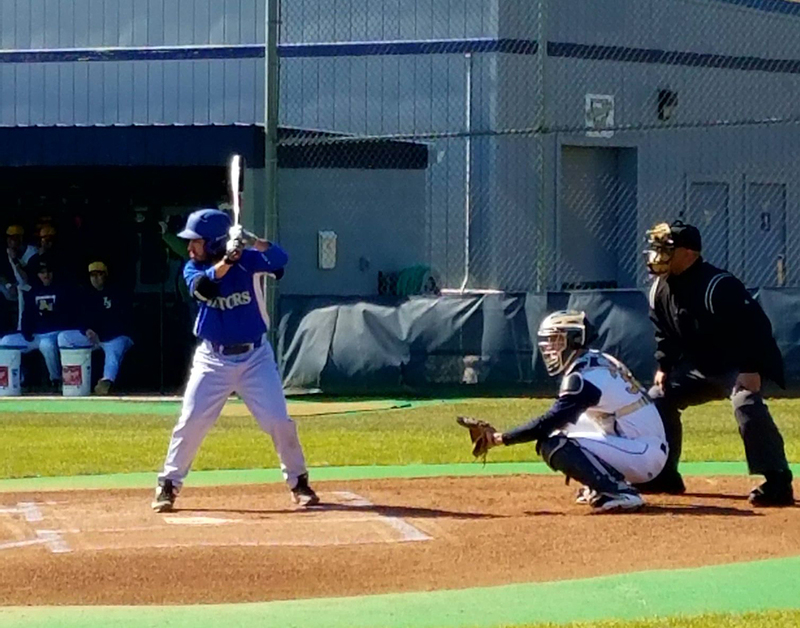 EGCC will complete their four-game series against Edison State Tuesday with a doubleheader beginning at 11 a.m. at Austintown Fitch’s Rich Coppola Field. EASTERN GATEWAY BASEBALL SCHEDULE REVISED; SUNDAY’S GAME EDISON COMMUNITY COLLEGE NOW POSTPONED WITH MONDAY’S GAME STILL SCHEDULED FOR AUSTINTOWN FITCH H.S. YOUNGSTOWN – Due to a cold, wintry forecast, Sunday’s baseball doubleheader between Eastern Gateway Community College and Edison C.C. has been postponed. Monday’s doubleheader – the first game nine-innings in duration, the nightcap seven-innings – will still be played with first-pitch set for 11 a.m. The Gators’ game with Butler Community College on Tuesday has also been postponed. All EGCC home games are played at Austintown Fitch High School’s Rich Coppola Field. YOUNGSTOWN – Evan Knaus, a freshman from Boardman High School, has been named OCCAC “Player of the Week” for the action ending March 23. In five games played, Knaus led the Gators (6-6, 2-2: OCCAC) to a 3-2 record, registered at least one hit in all give games with four multi-hit games to his credit. He batted .632 with 12 hits in 19 plate appearances, scoring three runs, driving in 10 runners with two doubles and a home run for a 1.579 OPS. In four league games at Clark State, he had 11 safeties and 10 of his r.b.i.’s. He’s the first Gators’ player to win conference “Player of the Week” honors this season, joining Noah Laster who was named conference “Pitcher of the Week” earlier this month. SPRINGFIELD – The Clark State Community College Eagles ended Eastern Gateway’s five-game winning streak, sweeping a doubleheader from the Gators 11-8 and 11-5 Saturday at Fairfield Park. In the opener, Grant Williams paced the Gators (6-6, 2-2: OCCAC) offensively with three hits, including a home run. Josie Ayala and Evan Knaus also had three hits and a double while Jeremiah Papa added two safeties. In the nightcap, Logan Torma and Andrew Wess had three hits with Papa, Knaus and Noah Laster adding two hits. EGCC will face CCAC-Boyce Wednesday in a single game at Austintown Fitch High School. First pitch at Rich Coppola Field is 1 p.m.
PIQUA – The Eastern Gateway Gators closed their charter baseball campaign with a doubleheader sweep of Edison Community College, winning the opener 5-4 and then capturing the nightcap 5-2 at Edison Field. With the sweep, the Gators finished their charter season as a sport with a 12-17 mark, breaking an 11-game losing streak in the process. In the opener, Kyle Campbell (3-5) tossed a complete game, striking out four while scattering nine hits. Mark Herron had a double and three runs batted while Hayden Kristophel added a two-run single to pace EGCC offensively. In the nightcap, Dakota Bingham (3-3) also went the route, allowing seven hits while striking out seven Chargers batters. Gators infielder Kevin Sierra Tirado went “4 for 4” with a double and two r.b.i.’s with Doug Painter’s lacing two safeties and accounting for the other three runs batted in. PARMA – The Eastern Gateway Gators (10-7) dropped an 8-1 decision to Cuyahoga Community College Saturday at Ron Mottl Field. EGCC rapped out five hits, led by Doug Painter who had two safeties. Mark Herron added a double while Kyle Campbell plated the Gators’ lone run with a single in the fifth inning to avoid the shutout. Three pitchers combined to scatter eight hits with Ryan Luciano absorbing the loss. Luciano worked four innings, struck out two and yielded seven hits. Brody McGrath went “3 for 3” for the Challengers, scored twice and added an r.b.i., Robert Garrett and Chase Carmey each added two hits with Doug Smith picking up the win. YSU and the Challengers will play a doubleheader today beginning at 1 p.m.
On March 11th, the Gators played a double header against Lorain County Community College. The first game the Gators won 5-3, and the second game 10-5. Colton Esposito got the first win in Gator baseball history. Colton Esposito winning pitch in game one.